Yesterday’s Tour of Flanders was the fourth edition of the race in its new look, Muur van Geraardsbergen-less format, and we are still learning new things every year about how the race is best ridden. The consensus seems to be that this is a more attritional Tour of Flanders than it is tactical, and therefore the best approach is to conserve energy for much of the race before making your move on the final ascents of the Oude Kwaremont and Paterberg, respectively the penultimate and last climbs of the race. That was generally the case this year – the majority of the race was characterised by conservatism and few attacks, as most teams (with the obvious exception of Lotto-Soudal) seemed reluctant even to send their best domestiques into moves. But the decisive moment of the race occurred some 10km or so before most of the favourites anticipated. With 30km to go, just after the Kruisberg had been summited, Etixx’s co-leader Niki Terpstra sprung an attack, and only the race’s eventual winner, Alexander Kristoff (Katusha), followed. The other riders did not realise it at the time but the race was disappearing up the road with them. Spectators may flock to the climbs of the Kwaremont and Paterberg, but Classics are often won and lost in these quiet roads in between the major climbs. 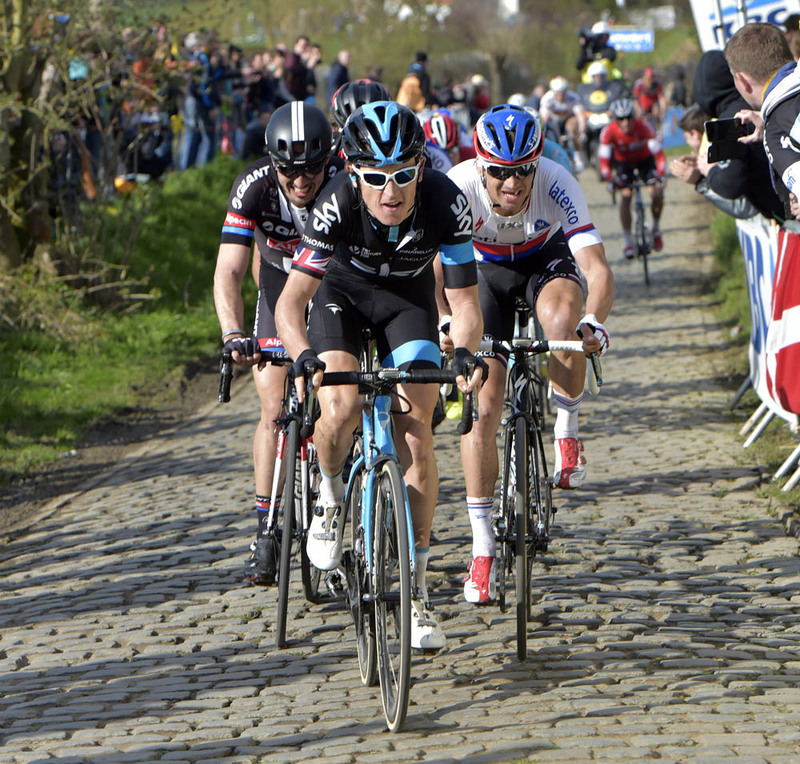 In fact, this point of the race with 30km to go also played an important role in both the 2013 and 2014 editions. In 2013 a small group including Jurgen Roelandts slipped off the front just after the penultimate time up the Kwaremont, while the 2014 race saw Greg Van Avermaet and Stijn Vandenbergh get away together again with 30km to go, on a flat stretch shortly after the Taaienberg. On both occasions these moves were partially successful – with the best rider in the 2013 break Roelandts finishing third after only two riders were able to catch and pass him, and Van Avermaet and Vandenburgh managing second and fourth in the sprint between each other and the two riders who caught up to them – but did not lead to victory. The difference this year? Fabian Cancellara’s absence. It was his explosive accelerations over the Kwaremont and Paterberg that dragged back the aforementioned attacks and earn victory for himself in 2013 and 2014 and with him missing, no-one had the firepower to control the 30km-to-go attack. ‘Spartacus’ has become so synonymous with the Tour of Flanders that his absence loomed throughout the race like an elephant in the room. The thinking of the other favourites in recent years has been simple – stay on Cancellara’s wheel and you’ll make it to the finish in the lead group. And this straightforward strategy very nearly worked, with Sep Vanmarcke and Peter Sagan coming a close and not-so-close second in 2014 and 2013 respectively. With him missing though, the riders looked instead to Geraint Thomas’ wheel as the path to victory. He rode strongly throughout the race and positioned himself right up towards the front over all the earlier bergs, while his Sky team made clear their intentions to control proceedings by setting the pace in the peloton. 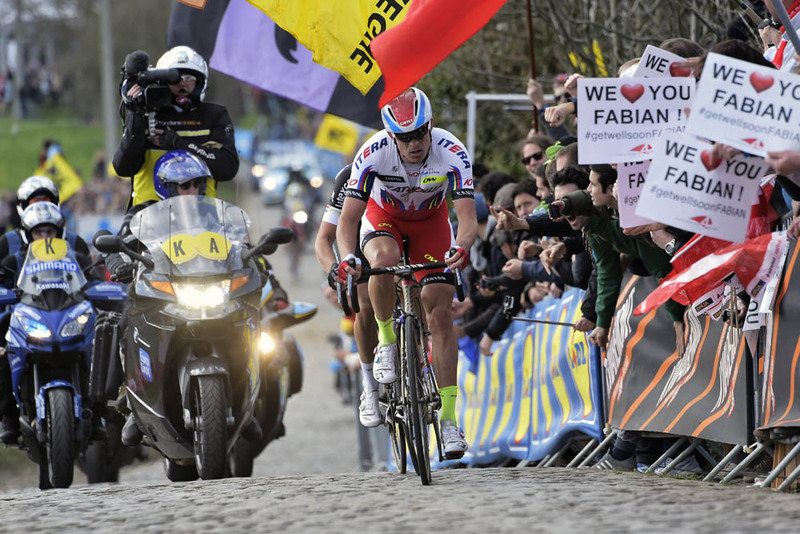 But Thomas is not Cancellara, and although he was the quickest on the final ascent of the Kwaremont, his acceleration failed to put much more than ten seconds into the gap behind Kristoff and Terpstra, and the Sky rider was joined on the descent by a handful of other riders. 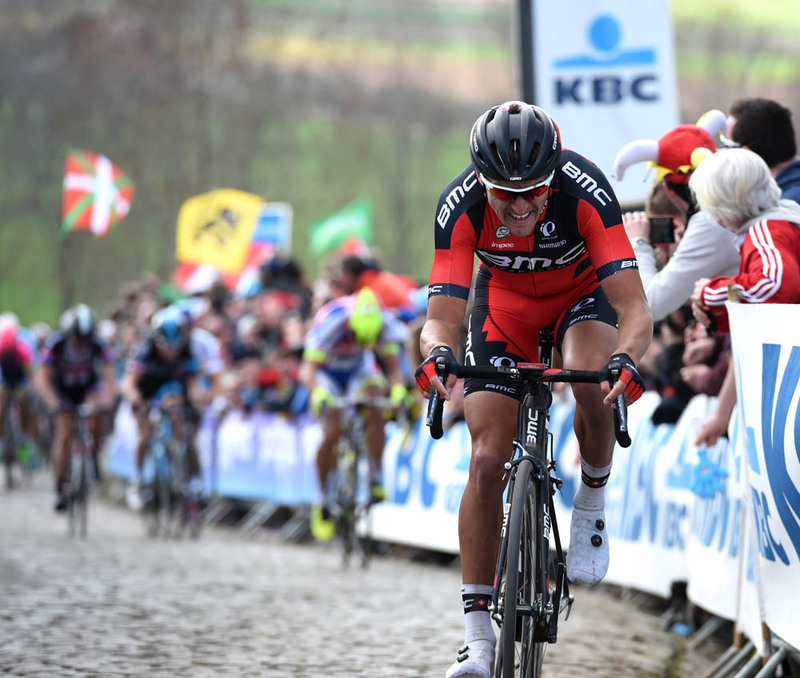 BMC may have led the charge over the following Paterberg, with Daniel Oss launching Greg Van Avermaet and the Belgian riding away from the rest with Peter Sagan (Tinkoff-Saxo), but by then it was too late – Kristoff and Terpstra had already built enough of a lead to survive the pursuit. To win, the other teams needed to be more alert and/or stronger at this 30km to go point. At the moment of Kristoff and Terpstra’s attack, BMC had four riders in the group, yet none of them managed to mark the move and they were slow in helping the others out in the chase. Lampre-Merida, Astana and Giant-Alpecin all failed to mark the move despite having more than one rider in the lead group, and even Lotto-Soudal, who had managed to put a rider in virtually every other attack, let the chance slip. Everyone was waiting for the final Kwaremont and Paterberg ascents, but perhaps the lesson of this year’s Ronde is that best chance for a victorious attack occurs a few kilometres earlier. For once, Etixx’s tactics can’t be criticised – at least, up until the final few kilometres. Did Terpstra really believe he had any hope of winning the two-man sprint against one of the quickest finishers in the world? 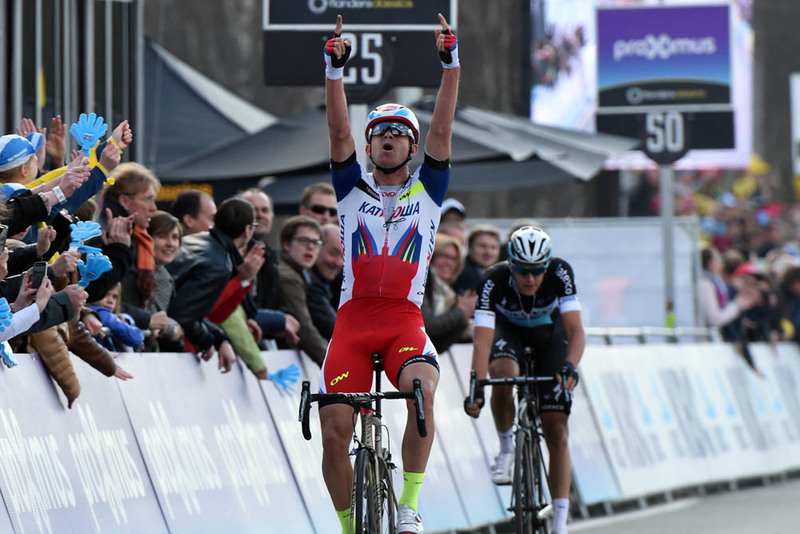 The expected attack never came, and Kristoff’s victory never looked in doubt on the finishing straight. The Norwegian now has two monuments to his name, and looks to go from strength to strength. He was probably the strongest in the race, and, as the only rider to recognise where the race’s key moment really lay, certainly the smartest.